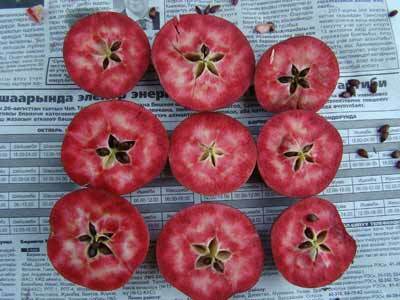 Large bright red apple with brilliant red flesh found in the fruit and nut forests of Central Asia. Surveys in 2007 found that only 111 trees now remain. The greatest threats to the species are likely to be over collection of fruit and loss of habitat. Over 90% of the Central Asian fruit and nut forests have been lost in the past 50 years. Fauna and Flora International has a project focused on conserving it.. This and Malus sieversii, the progenitor of the modern apple, are from the same region - Central Asia - from which many of the fruit and nut species we eat today originate, so it's a hugely significant habitat and contains much of the ancient wild genetic stock of modern fruit and nut varieties.